Following a summer marked by low and warm water levels this weekend’s cold snap in the Southeast spurred an incredible trout bite in Cherokee, North Carolina. While Monday and Tuesday saw nominal pressure, those who were fishing saw 10-fish limits in fewer than 30 minutes in some instances. Some of the upper stretches of the systems in Cherokee saw temperatures fall into the mid thirties over the weekend and early this week. While air temperatures did rise into the seventies, it was enough to spark action. Trout planted Monday, and holdovers, responded quickly to the cooler water by gobbling up salmon eggs, the choice bait on the reservation this week. While many southeast states curtail trout stocking during the summer and early fall, Cherokee continues to plant liberally. We were in town to film Pautzke Outdoors this week and saw them stock rainbows to eight pounds, a five-pound brown and brook trout up to two pounds. There was an endless number of trout available. In all honesty, we caught more than 100 trout in fewer than five hours of filming. Most were one to two pounds. Meanwhile, we caught three fish greater than three pounds and two larger than five. Our success came exclusively on Balls O Fire salmon eggs. We walked the bank with a backpack loaded with Gold Label, Silver Label, Yellow Jackets and Orange Deluxe eggs and switched off every 15 minutes. All the eggs worked extremely well. However, as the trout became conditioned to one color we switched, which induced fresh strikes. Cherokee waters are always clean. On the other hand, when they recede in the fall they become clearer, which forced us to downsize to four-pound Berkley Vanish. Anything greater would reduce strikes as the trout become line shy. We used Leyland trout floats and Gamakatsu No. 10 salmon egg hooks. There’s no need to use larger hooks. We caught trout to six pounds on these small hooks, which allow for a perfect drift. Locating fish isn’t going to be a challenge. The entire system is packed with trout. 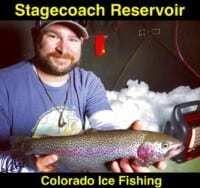 Keep in mind, the creeks are stocked several times a week and you’ll find trout throughout the creeks in the larger pools, behind boulders, in runs and tailouts. Other than shallow, non-oxygenated water, you’ll find trout in every portion of the water column. Editor’s Note: A North Carolina fishing license isn’t required to fish in Cherokee. However, a tribal permit is. They are $10 per day and come with a whopping 10-fish limit. For more information please visit www.fishcherokee.com.